The elk are putting on a show in northcentral Pennsylvania right now and they don’t care if we watch. Elk or wapiti (Cervus canadensis) are one of the largest members of the deer family. Males weigh up to half a ton(!) and can be five feet tall at the shoulder with antlers five feet across. The females, without antlers, are only 3/4 their size. The difference is due to their lifestyle. From late August through mid-October the elk herd assembles for the mating season, called “the rut.” The males sound off and fight to win females for their harems. Bigger is better. The strongest males have the most offspring. Their bugling and sparring is fascinating to watch and you can get fairly close because the herd is distracted. 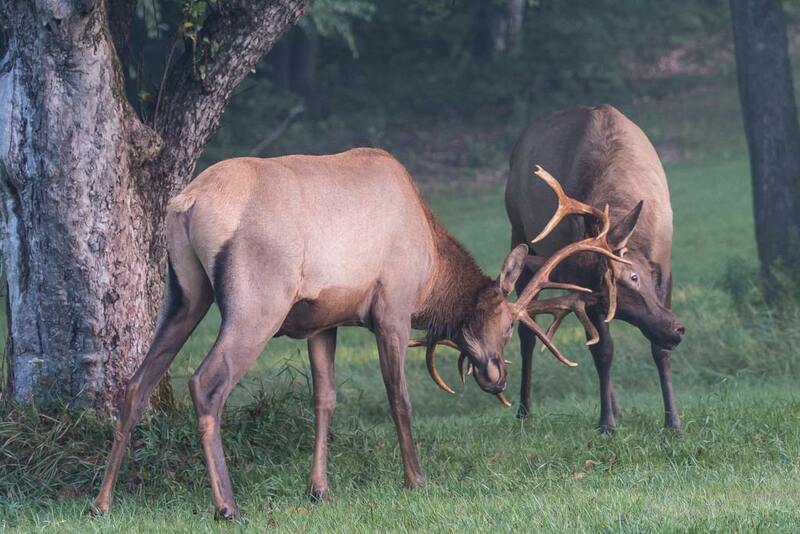 Paul Staniszewski photographed these two locking antlers. And here’s a 6-minute video shot in Benezette, home of Pennsylvania’s largest elk herd. Visit Elk County, PA to watch the show. Click here for more information. p.s. Wapiti were reintroduced in Pennsylvania in 1913 after we extirpated them in the late 1800s. Did you know white-tailed deer were reintroduced to Pennsylvania, too? Google Pennsylvania elk camera to watch the elk live!